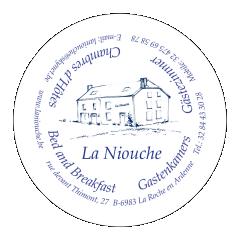 La Niouche B & B offers coziness and comfort for groups, families and individual guests. You can choose from two guestrooms 'Tourmaline' and 'Vert de Gris' which are both located on the second floor. You can also dine on demand or possibly end the evening with a drink. The spacious common living room overlooks the garden. In winter, a cozy fireplace creates the right atmosphere. On warm days, the extensive terrace and large BBQ to take long and relaxing evenings. The breakfast with regional specialities and homemade jams is served in the separate breakfast room. Pure indulgence ! Even toddlers are welcome in the child-friendly La Niouche . The entire accommodation is provided for optimal comfort for parents and children. Security of residence and garden insure you and your family a carefree holiday.